After receiving my kit yesterday along with a few flint and glass flakes, I made an attempt to get to grips with a few things I thought I had learned from youtube. Upon taking a flake a looked for an existing platform, great, I thought. I'll try to have a go at removing a flake or two. WRONG. Gripping the flake and leather in ne hand as I have seen many time times, and the pressure flaker in the other hand I pressed down and the tiniest little pathetic shard came away. I tried again and again and this was all that happened. Upon writing this, I just realised I was actually pivoting the flaker, might this have something to do with it? Should I be keeping the flaker perfectly straight and moving it parallel to the flint? - On second thoughts, when using an it stick the direction of the point will change if you have it wedged under your arm? This is copied from a reply I made to another knapper who asked the same question. Everyone starts this way, like in the top picture you try and release the flake with the flaker and flint quite straight, but what actually happens under the downward pressure your hand holding the flint bends down and you end up releasing at a 45 degree angle as in the second pic, which means you only get a tiny flake. You need to keep the flint and flaker straight as possible at the time the flake releases. Also a lot of pics and vids show the platform being flaked too close to the middle, this is quite difficult. Much easier go for a steeper platform and take the flake from near the bottom as the arrow shows or right at the bottom, even better. Also remember inward power is important, with flint there has to be a lot of power, with glass less. Here's a good vid (the very first one he knaps). Notice he uses and almost square edge and places the tip of the flaker almost at the bottom of the edge (not near the middle). 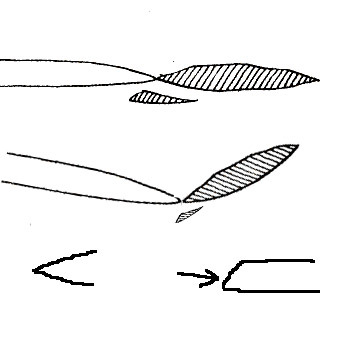 He also uses an arch technique to get power, starting with the flaker at an angle steeper than straight and bringing it to straight as he releases the flake. 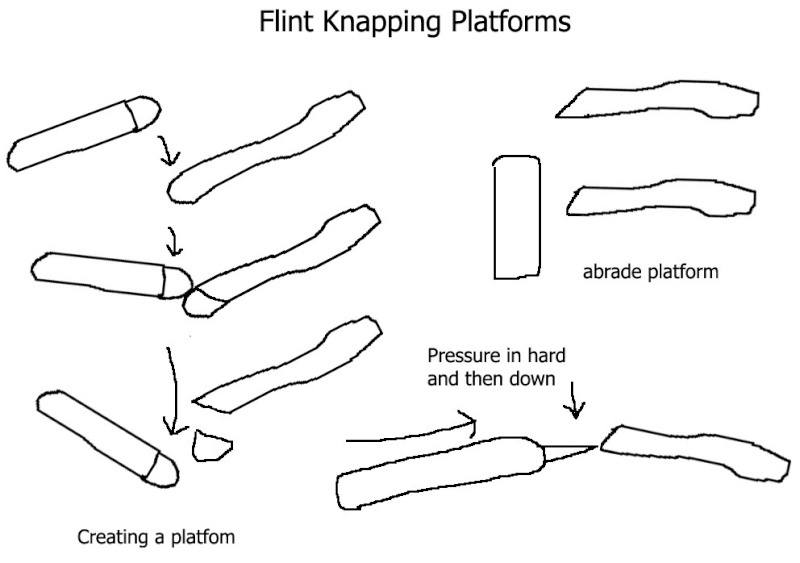 Also what he does will not work on flint, only glass, the technique is a identical for both, but he would need a lot more power for flint, putting a lot more power on the pressure flaker. Okay, I think I've got that. So I need to hold the tool as secure as possible too right? The only thing I really don't understand, is the abrading. When, where and what is the reason? if you take a flake off the edge left is very thin and sharp, the edge is also very fragile. If you press the pressure flaker against the sharp edge it will simple crumble. 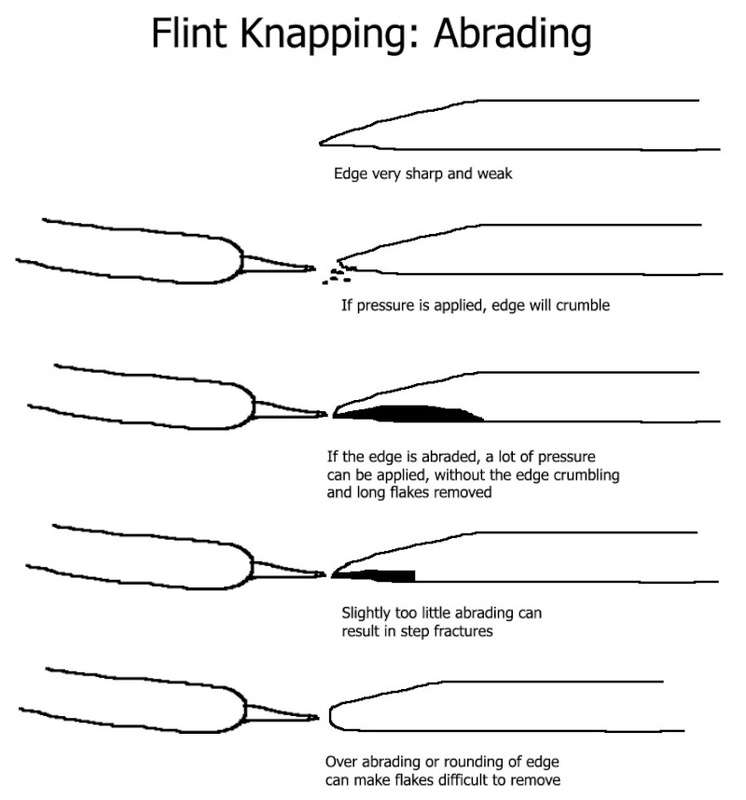 abrading is done the grind a sharp edge dull and so strong enough to take pressure without crumbling. If the edge crumble when under pressure you haven't abraded enough, alternatively over abrading can make it very difficult to remove a flake. Key, the black area on diagram 3 and 4 represents the flake. So I need to abrade the edge I am about to apply pressure to? Or the edge under the platform? Awesome thanks. Is there somewhere I can see all your drawings together? Yes, this topic. That's all there are. Great bit of information and well put across.